On March 3rd of this year, I had the pleasure of meeting—and joining—Steve Good as he completed the final leg of his 30th birthday running journey beginning in Iowa, and ending in my home of Washington, DC. Steve and I connected through a mutual friend and colleague, the one and only Dr. Edward G. Whipple. As an avid runner, as well as someone who chronicled the departure from my twenties and the launching of my thirties via the modern day art of blogging, I had no hesitation in joining in on Steve’s run. Besides, I’d been running DC for nearly ten years, and figured I could provide some utility as a sort of guide e.g. avoid tourist pitfalls, remind them to stand on the right side of the metro escalator. Important details like that. Being very much a planner, it probably wasn’t more than within a few minutes of meeting Steve that I was asking, “So, what’s next with this blog thing? What are you going to do after today?” I’m delighted that he has decided to continue – and encourage – his own experience through http://www.agoodrun.com. It’s an honor to be the first guest blogger for this experience, and find it fitting to launch this post where Steve’s 30th birthday journey ended – Washington, DC. Now, what does your mind conjure up when you think of Washington, D.C.? It’s likely that images of the White House, Capital Dome, Washington Monument, and Lincoln Memorial all just flashed in your mind. Yes, yes, those landmarks all exist (even despite that little shakeup of an earthquake we experienced back in August – the one that caused a book or two to fall off of a shelf? Yes, that one). In running for this blog, my goal was to avoid those exact landmarks. My going to the National Mall is akin to native New Yorkers hanging out on the observation deck of the Empire State Building all Tom Hanks/Meg Ryan style, or denizens of LA sunbathing in front of the Hollywood sign. Quite simply put, those of us who live in DC tend to avoid the more popular tourist attractions. I can’t begin to count the number of times I’ve received the question from members of my family, “So, you actually live IN DC?” Maybe they’re thinking that all there is to DC are the aforementioned memorials and monuments. Isn’t that what the movies have taught us about DC, anyway? One might realistically think we all come home from our day jobs to crash in the Lincoln Bedroom. Like many cities across the country, there is significantly more to DC than what one would catch in the typical Hollywood blockbuster, or, heaven forbid, on CSPAN. We are a diverse, tapestry of a city – Black, White, Asian, Latino, Gay, Straight, Trans. Show me the identity box and we can check it. It’s part of our beauty, and it is very much our community. Sticking with this theme of community, the beneficiary of my run is the Concert for Life. Since 1991, the Concert for Life – an AIDS Benefit – has raised over $905,000 with 100% of proceeds going to organizations that help people living with HIV/AIDS. The Concert is performed in Foundry United Methodist Church (most on that location coming soon!) and is a celebration in song of friendship, beauty, love, and all of life’s joys. This year’s Concert will occur on Friday, May 19th. For the second consecutive year, I have served as co-coordinator of Concert volunteers. If you are interested in supporting the Concert through your time or resources, please visit our webpage. In my run, I wanted to hit landmarks of the mundane DC variety. My running buddy and photographer was none other than my husband of eight months, and partner of seven and a half years, Jason DeSanto Jones. I should point out that like any healthy married couple, Jason and complement in each other in many fashions. He cooks. I clean. He manages the finances. I manage household logistics, our schedule. We also have learned that running together is generally not the best idea. Like many couples, we both want to be the one to decide the course. He’s also faster than me, though I tend to run longer distances. Thus, our running together is quite a rare site. Yet, being the dutiful partner and husband, Jason not only ran with me and photographed our stops, he also helped me determine which stops we would include. The date of our run was Saturday, April 21st – a beautiful, sunny, spring day in the 70s. Certainly we couldn’t go wrong with that. Stop #1 was the U Street Metro Station. At this point, you’re now probably thinking to yourself, “Really. You’re telling me there’s much more to DC than the monuments, and you start this whole thing off with a stop for underground transit?” Indeed. You see, I actually met Jason on the metro in the summer of 2004 when we were both commuting from this exact metro station to the University of Maryland, College Park. It was after two months of seeing him multiple times a week in transit between these two locations that I finally worked up the nerve to say “hello”. Over seven years later and after many an on-going adventure he’s not only my photographer du jour, he’s my loving, intelligent, fun, patient, and sensible husband. Stop #2 was Meridian Hill Park. This is perhaps one of my favorite places in DC. 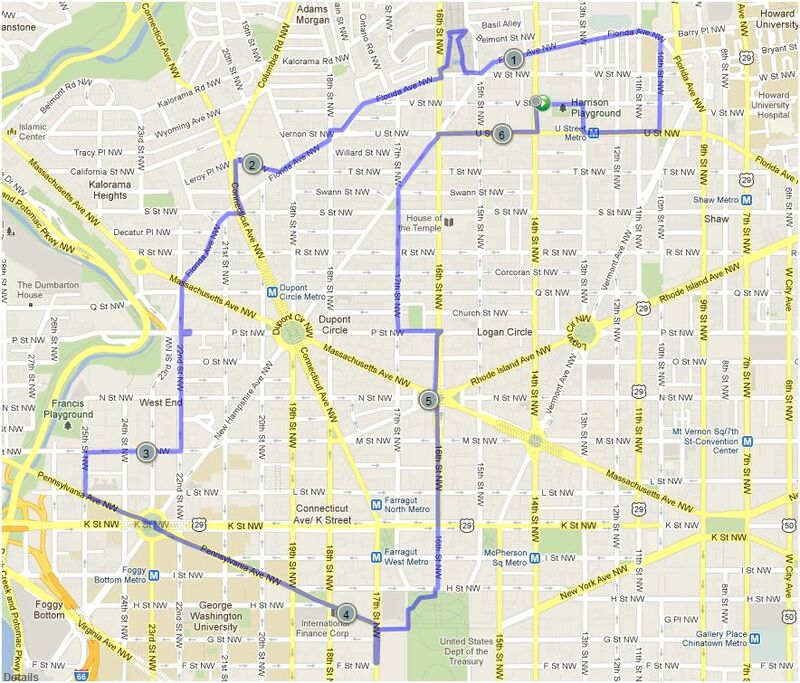 Located in Northwest DC, the park is bordered by 16th, Euclid, 15th, and W Streets. It is easily my preferred spot during the summer months to sit out on a sunny weekend afternoon, take in some rays, read, and find some zen in the middle of the city. At the top of the park sits a statue of Joan of Arc on horseback with sword drawn. I’m not sure why a young French girl burned at the stake as a heretic in the 14th century is the centerpiece of a park in Washington, DC. It is quite random after all. Thus, in the spirit of French saints and randomness, I chose this spot to thank my dear friend, Stephen Seizilles de Mazancourt – dual citizen of the U.S. and France and perhaps the most multilingual person I know. Jason and I befriended Stephen in, of all places, a club in Rome, Italy during our first tour of Europe in May 2009. He won the award for traveling the furthest for our wedding last August. Stop #3 would be what is known officially as the Washington Hilton though is known to most locals as the Reagan Hilton or the Hinckley Hilton. This is the spot where, on March 30, 1981, John Hinckley attempted to assassinate then President Ronald Reagan in a rather perverse attempt to impress actress, Jodie Foster. I’m not really smiling in the photos of me at this space as I generally tend to disagree wholeheartedly with the idea of shooting anyone, including democratically elected presidents regardless of political party or affiliation. Call me old fashioned. 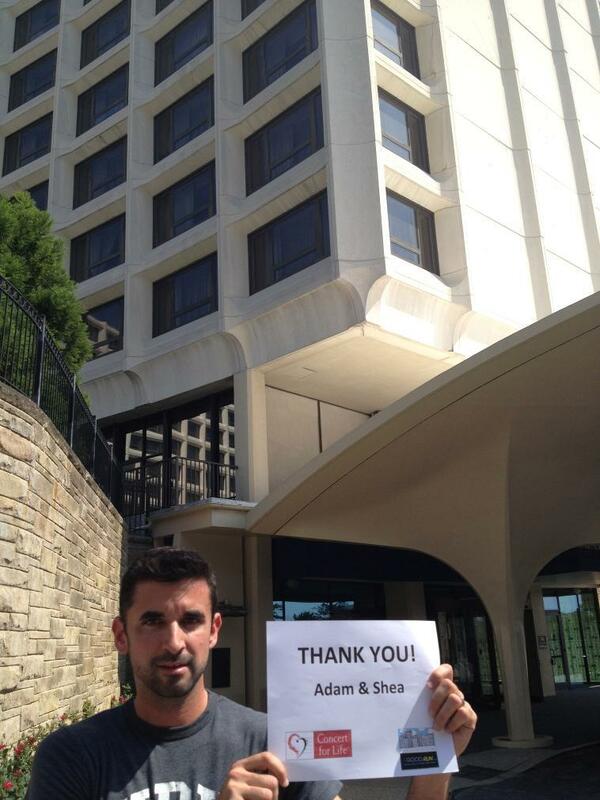 My thanks at this historic spot are to some of my oldest friends, Shea and Adam MacDonald. The three of us attended high school together and were all members of the track team. Our involvement and skill level within said track team certainly varied. Shea and Adam were like night and day in high school – he may think that Reagan is the second coming of Messiah, and she once attended an environmental protest dressed as a whale. Yet, they reconnected several years later (thanks to yours truly), started dating, fell for each other, got hitched, and now have a rock-star two-year old son, Brendan. A lovely couple and a great example of how bipartisanship can function! Stop #4. WE falafel! YOU falafel! EVERYBODY falafels! How I enjoy a tasty falafel – well, maybe not mid-run – but nonetheless I am quite the admirer of this fried chickpea piece of heaven. My favorite spot for this tasty delight is V Falafel. 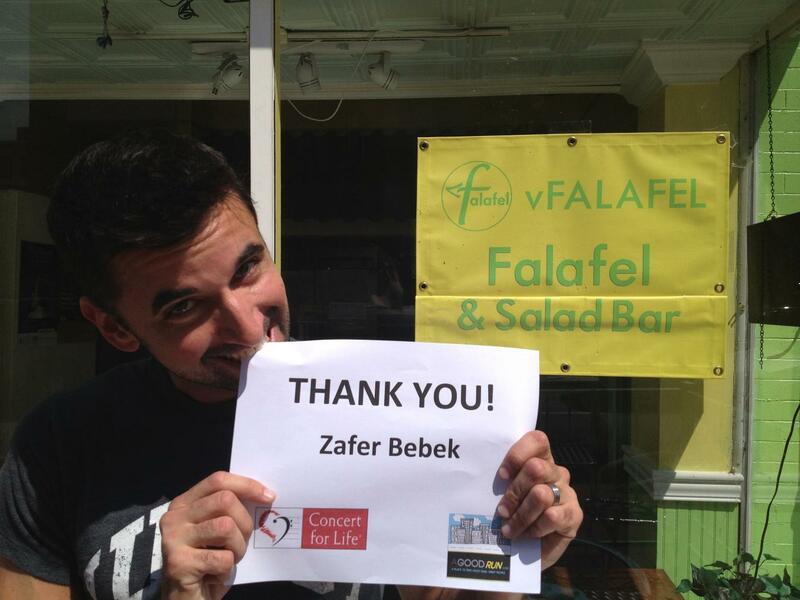 Located in Dupont Circle, V Falafel is owned and operated by my former co-worker and friend, Zafer Bebek. Zafer might just be the hardest working Turk in show business. By day, he’s the mild-mannered IT guy at a higher education non-profit association, father of two, and can be found many a night – and late night – working behind the counter at V Falafel. Stop by and patronize him. You won’t be disappointed! Stop #5 would be the neighbor to Barack and Michelle. In fact, Jason had his back to the White House while taking this photo. Too bad this post won’t contain mentions of any of the typical DC landmarks otherwise you’d see the White House! Alas, what you see below is yours truly in front of the Corcoran Gallery of Art. Located on the ground level of this grandiose structure is the Corcoran College of Art + Design. It was in this space that I served as a graduate apprentice during the summer of 2005. My task in this role was to assist in the creation of a first-year seminar for Corcoran students. 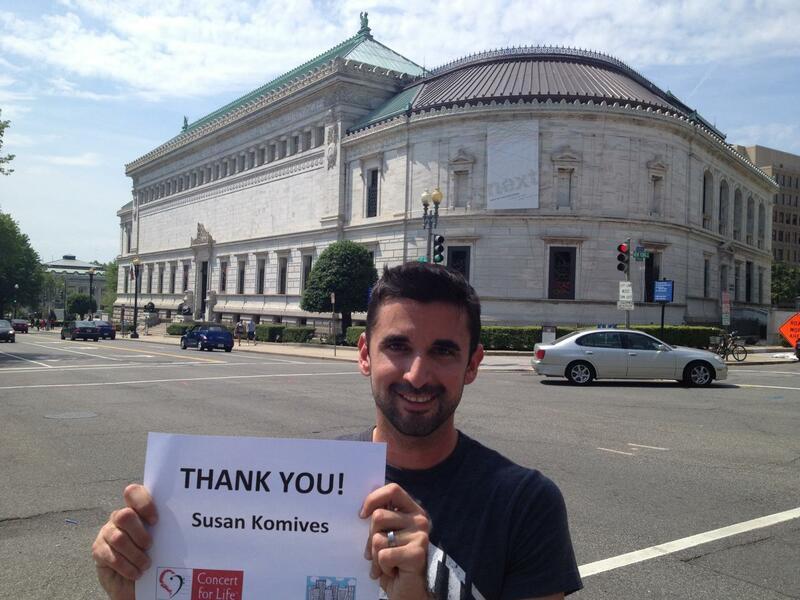 I chose to thank my graduate school advisor, Dr. Susan R. Komives at this location. It was Susan that guided my graduate school journey, instilled confidence in me that I can write, and graciously gave me a second chance after some early twenty-something transitional “Should I stay or should I go now” graduate school woes. Susan will retire this year from her role as Professor in the College Student Personnel program at the University of Maryland, College Park. Google “Komives” and “Leadership”. Careful though, you might just crash a server somewhere with the wealth of information you’ll find. Stop #6 has been my house of worship for the past decade, and the church where Jason and I married in August 2011 – Foundry United Methodist Church. “Foundry is a historic, progressive United Methodist Church that welcomes all, worships passionately, challenges the status quo, and seeks to transform the world through God’s love. Drawing upon significant rituals and spiritualities, Foundry is innovative and pioneering in our efforts to be a place of positive change within Christianity, within our denomination, within ourselves and in the world.” Not only does Foundry rock, it is also the location of the 19th Annual Concert for Life – the beneficiary of my run. At this spot, I thank my friend, Matt Mustard. 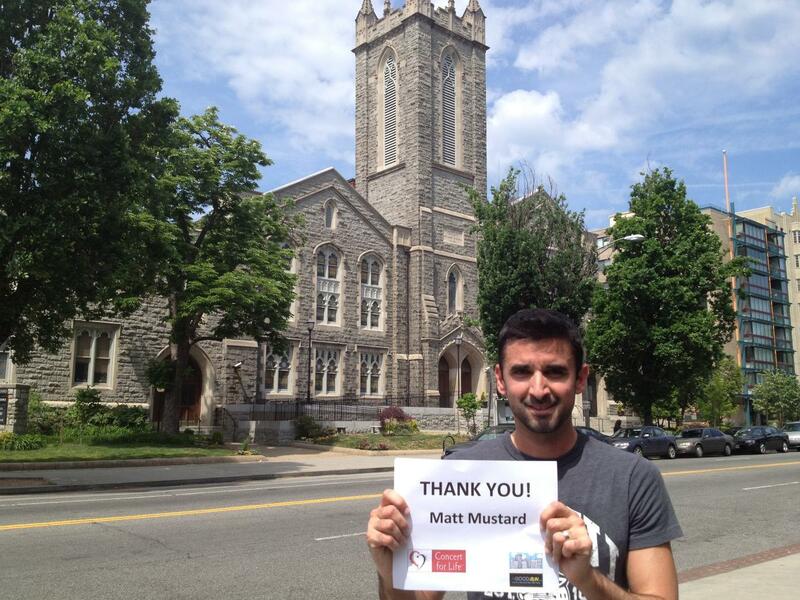 Matt is the Coordinator for Lesbian, Gay, Bisexual, and Transgender Advocacy at Foundry. This past year he has worked tirelessly to coordinate efforts for the United Methodist Church to pass a resolution allowing churches to perform marriages for people of the same gender, and to remove exclusionary language from the church’s Book of Discipline which states that “homosexuality is incompatible with Christian teaching.” Whether this change occurs in the near or distant future, I am proud of my friend for contributing a critical ripple in a very large pond. 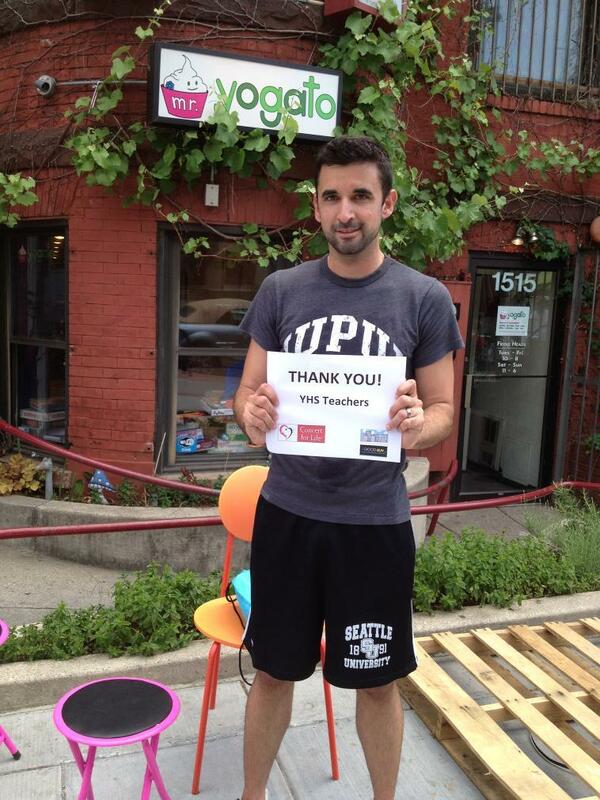 Step #7 is my favorite frozen yogurt spot in DC – Mr. Yogato! Not only does this Dupont Circle neighborhood fave offer tasty frozen yogurt options and toppings, it contains an original eight-bit Nintendo system, board games, and the opportunity to get discounts for froyo via various trivia questions. Of course, if trivia is too difficult one one can opt to have the Mr. Yogato logo stamped on their forehead for a 5% discount. Ever since I was tapped as extra for the game show “Where in the World is Carmen San Diego” I’ve always had a special affinity for geographical trivia. Where else does one get to ponder six countries that include the letter “P”(but not as the first letter) for a 10% discount on froyo? 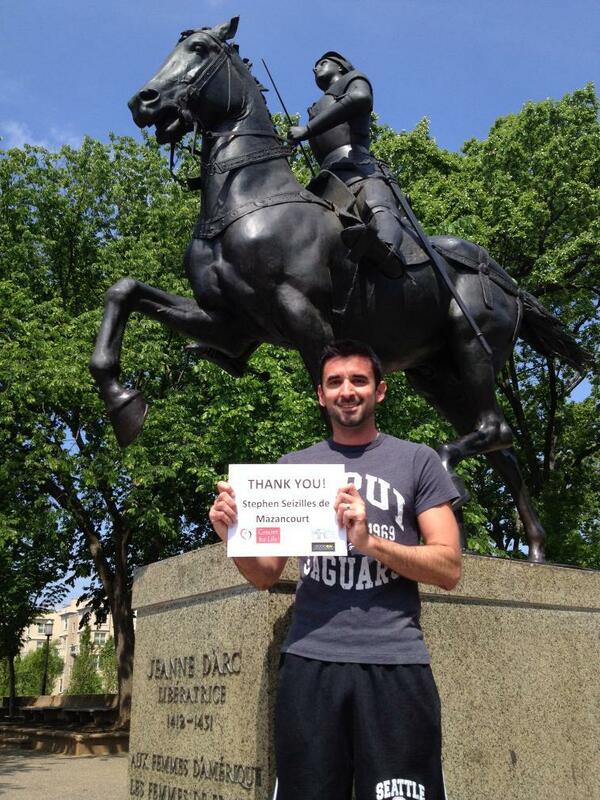 In honor of my penchant for geographical trivia, I chose to thank my teachers at Yorktown High School at this stop. I believe in the transformative power of education, and am very much a lifelong learner particularly around issues of society, culture, politics, and education. I thank my teachers for that. Stop #8 is the neighbor to Stop #7 – JR’s Bar & Grill, though few people under the age of 30 realize that the grill portion of the name used to be significant in that one could actually eat there. I’ve been patronizing this local DC gay bar since my college days. No trip to gay DC is complete without visiting this neighborhood watering hole. Despite a change here and there over the years – the coming and going of Fagala Feud, the coming and going of food, the moose head no longer hanging on the wall (why there was a moose head there in the first place is beyond me), the Sunday $2 rail vodka drinks now being $3, the proliferation of flat screen TVs, and the banning of smoking (hallelujah) – this place has always maintained a friendly, neighborhood appeal. Plus, there is always Showtunes on Mondays. 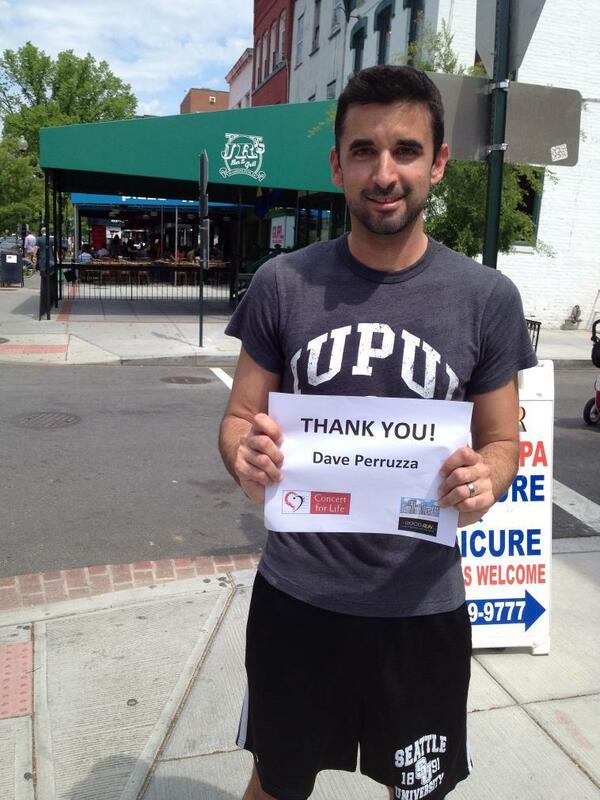 For keeping this show going, I like to thank JR’s manager, David Peruzza. Stop #9 was the final stop of my run, coincidentally the block Jason and I call home. 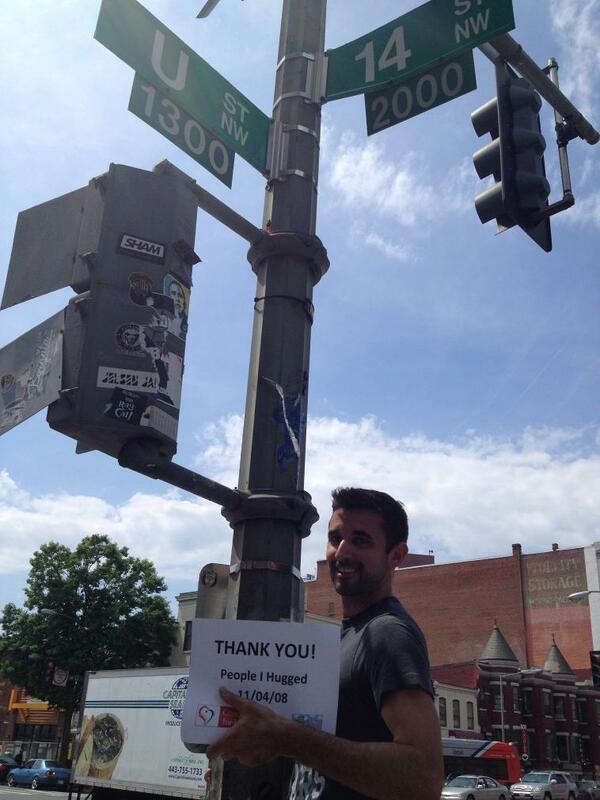 The corner of 14th and U Streets NW is a bustling, constantly changing intersection in the District. This is the spot where, on April 4, 1968, DC experienced the first night of rioting upon the assassination of Dr. Martin Luther King Jr. The riots lasted several days, resulted in multiple deaths (mainly from arson), cost millions in property damage despite the National Guard eerily keeping curfew on the streets of the city, and they altered the face of our neighborhood – and DC – for decades. This was also the same spot on November 4, 2008 – 40 years later – where jubilation ran rampant at the election of the nation’s first black president. I have never seen a night in Washington, DC as I did that night. Diverse peoples poured out into the streets, hugging, giving high-fives, in a cathartic exercise of celebration and emotion. Regardless of one’s political affiliation one cannot look upon that night and not observe some form of collective healing for the community I am proud to call my home. 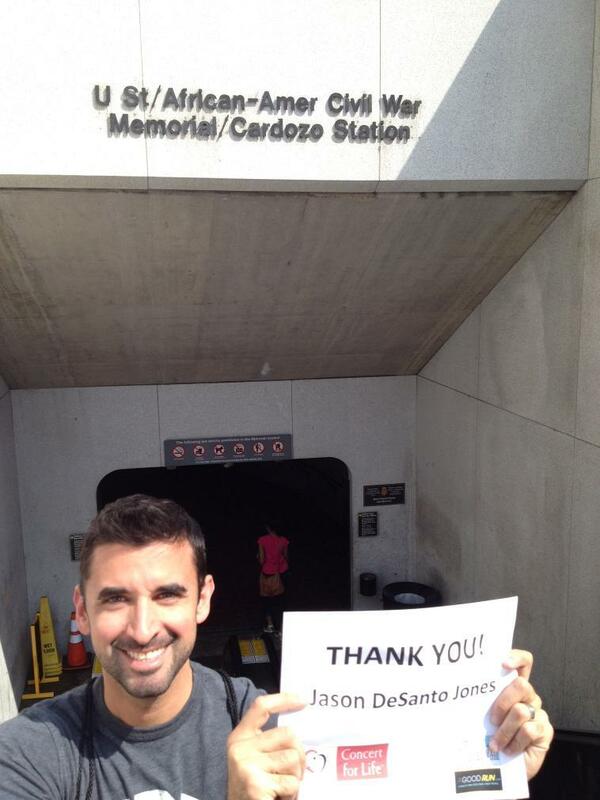 Joey DeSanto Jones began running in high school as part of the spring track team. His primary sport those days was swimming, and he figured running track during the off-season would prevent him from going to waste. Little did he know that he planted the seed for an adult passion. He is now an avid runner enjoying regular runs throughout Washington, DC, as well as other cities when traveling (including London, Berlin, Barcelona, and Sitges last August while on his honeymoon), and in his second home of New York City during regular work trips. By day, he is the director of project development and communications for a comprehensive higher education consulting firm. Originally from Williamsport, PA, Joey is a two-time graduate of the University of Maryland, College Park in Communication Studies and College Student Personnel. His passion for reading is just as strong as his passion for running. Whether it’s the New York Times or a comic book, you’ll generally find Joey either reading or running – thankfully, though, not at the same time. Joey, and his husband, Jason, are frequent travelers, consumers of HBO dramas, and lovers of a quality roof deck on a sunny day with a cool beverage. Both Joey and Jason are looking forward to January 2013 when they will participate in their first Ragnar from Miami to Key West. 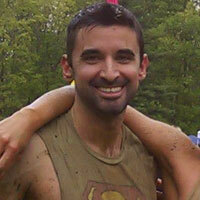 Should you find yourself in DC and looking for a running buddy, look no further! I love this first post, and am so excited to be part of this project! Joey, you have me all excited to explore DC during the Marine Corps Marathon this fall — and have inspired me not to take Steve’s readers through the Times Square tourist trap in September. Concert for Life sounds like an amazing group. If you want to further support the fight against AIDS — while logging a new PR to boot — you and your husband should make a trek to NYC June 23 for the New York Road Runners’ Front Runners New York Lesbian and Gay Pride Run (5M). A portion of the proceeds go to Broadway Cares/Equity Fights AIDS, plus the race t-shirts are usually rad. I’m always down for showing off my city’s running scene, so take a look!